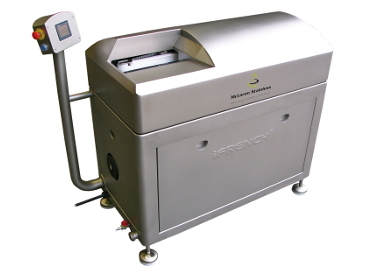 The most energy efficient French rack machine currently available. High pressure water is used as the media to remove the meat from the bones. Depending on lamb rack specifications the iFrench has the ability to process 20 x 8 rib lamb racks per minute in a continuous operation (versus conventional batching process). The racking machine can also do pork racks. 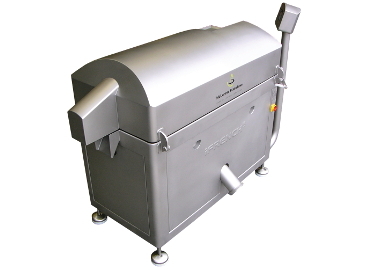 Using custom designed high pressure water jets sourced from Europe, we have been able to drastically reduce the pump size from what has been the industry benchmark for a number of years, without compromising the meat removal. High pressure water is used as the media to remove the meat from the bones. Depending on lamb rack specifications the iFrench has the ability to process 20 x 8 rib lamb racks per minute in a continuous operation (versus conventional batching process). The iFrench uses an easy Touch screen PLC control system. Manual adjustment of the frenching height, via a handwheel, gives complete control over how much meat / fat is removed from the rack, and this height is indicated on the touch screen.